I’ve seen everything in my 25 years of trading on the floor of the Chicago Board of Trade (CBOT). Traders have made bets that many would consider guaranteed losses — and make you wonder how a person got the job in the first place. Blow up and their career is over. Win and their legacy is defined. And the trader made a fortune. Early last Friday, a trade most people would consider an absolute zero flashed on my Bloomberg monitor. That’s right, the algorithm that runs our “WPI indicator” revealed the hottest opportunity in the market is a relic of a former all-star company. In fact, it’s a company I am sure most people would have thought went bankrupt. But right now, it’s one that could make you a substantial profit. It got my attention so I dug into the story. The stock market was rallying out of the worst recession seen in decades, the world was rid of Osama Bin-Laden and Kim Jong-Il, Angry Birds was at the top of the gaming charts, andBlackberry was one of the hottest phones in the market. That theory would make sense, considering that since Blackberry’s peak in 2011, Blackberry’s share of the smartphone market has dropped to 0.00% of the entire market. Blackberry mobile phones were first used by corporate executives and were a favorite among Wall Street bankers for their email function. However, these handy smartphones were quickly taken up by teens with addictive texting habits. Blackberry phones were all the rage. But when was the last time you saw a physical Blackberry? 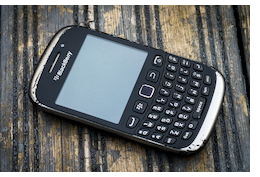 Apple iOS and Android took Blackberry from the must-have-phone to the clunker on the clearance shelf in a few short years. 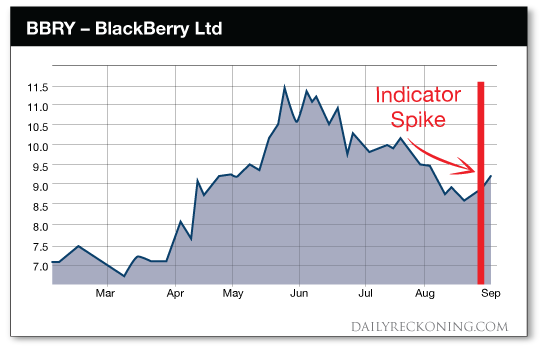 Nobody has a Blackberry phone these days, yet Blackberry could be the key to striking gold in the stock market. Today, Blackberry is on the comeback in one of the hottest industries around. Better yet, our WPI indicator revealed that insiders are PILING into Blackberry. If you are unfamiliar with the WPI, it’s my patent-pending algorithm that detects large chunks of insider stock buying. While insider trading is illegal, many investors still take action on information that has yet to become public. The WPI picks up on these money moves, which allows us to forecast stock announcements before they become public… Giving you the chance to profit on big percent movements. 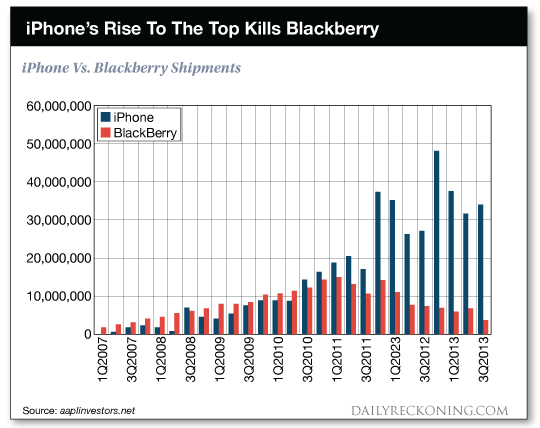 And when you dig into the facts, it makes sense why insiders are taking big stakes in Blackberry’s stock. Blackberry has taken on the mantra “Innovate or die”— and has completely reworked their business towards becoming an enterprise software company. In fact, you could be using a Blackberry product every day and not even know it! Blackberry is currently the market leader in operating systems in the automotive space. Cars these days are much more complicated than they used to be. All of those parts, sensors, navigation systems, and infotainment displays are powered by computers. And Blackberry’s QNX system is the leader in automotive operating systems. The QNX is in 60 million cars globally, and Blackberry is set to deliver another 36 million QNX licenses in 2017. Blackberry is working behind the scenes in the autonomous vehicle market. Blackberry QNX has paired up with the Ontario government to launch the first automated vehicle pilot program in Canada. The Ontario government is quoted in saying the program is meant to position Ontario as a global leader in the autonomous vehicle market. Ford has taken a big interest in Blackberry— they recently hired 400 Blackberry engineers to help develop wireless technology for Ford vehicles. And just last week, it was announced that Ford and Dominos are pairing up to test autonomous driving in Ann Arbor. Starting this Wednesday, some pizzas will be delivered by driverless cars up in Michigan. Do you see the progression here? Blackberry is getting into something BIG. The Ontario government and Ford are using Blackberry to develop their programs. If autonomous driving is set to take off, Blackberry has the necessary relationships to make an astronomical comeback in the tech industry. Insiders love it. 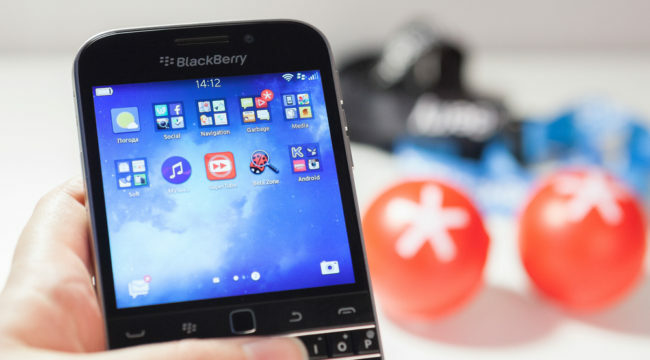 A HUGE influx of cash is flooding into Blackberry. This is Blackberry’s chance to make a comeback. From what the data is telling me, Blackberry is set to make a hot run in the autonomous vehicle market. And it’s not just Blackberry investors are clamoring over. The WPI picked up huge movements over the past few weeks on two other companies unrelated to Blackberry. These movements allowed my readers to make profits of 63% and 100% in a few short days. And right now, even though Blackberry is a good looking opportunity, there are other plays popping up each and every week. Fact is, “smart money” is always taking action. To learn more about our WPI Indicator, and all of my latest opportunities, click here for more information.